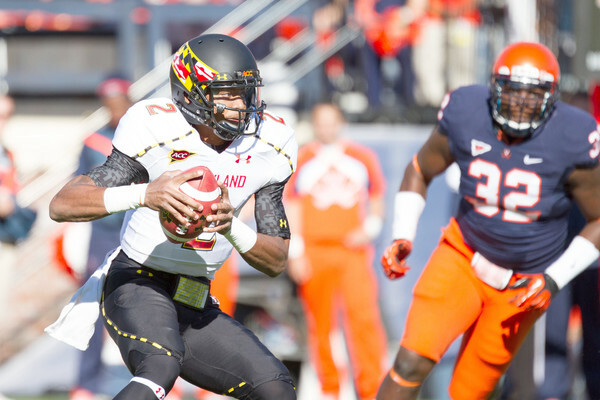 Maryland QB Devin Burns (#2) withdraws from school, leaves team. The Maryland Terrapins just lost sophomore quarterback Devin Burns who announced his withdrawal from the school and his expectation of transferring to another program. As of late, the QB position has been suspect for Maryland with the Terrapins losing five signal callers in 2012, four to injuries and one, QB Danny O’Brien, to transfer. However, in 2013 Maryland will be deep at quarterback with stiff competition. It is likely Burns’ withdrawal is a result of him presumably not going to see much playing time. In 2012, QBs C.J. Brown and Perry Hills were both sidelined with ACL tears. Burns, a converted wide receiver, was called to take snaps under center. Unfortunately, his position switch was short lived as he suffered a season ending Lisfranc fracture against North Carolina State after just three games. His replacement, Caleb Rowe, also did not last long suffering a torn ACL during the Boston College loss. At that point, head coach Randy Edsall had no choice but to convert freshman linebacker Shawn Petty to quarterback. With such a key position plagued by injuries, the Terrapins offense was anemic ranking near the bottom in passing (104th, 181.8 yards/game) and points scored (109th, 20.1 points/game). As a result, the Terrapins finished the season with a six game losing streak and finishing a disappointing 4-8 (2-6 in ACC play). Fortunately for Edsall, he should have a logjam of quarterbacks come 2013 with Hill and Rowe returning from injuries, transfers Ricardo Young and Dustin Dailey joining this spring, and touted freshman prospect Shane Cockerille committing to the team. With a bevy of quarterbacks at Edsall’s disposal, Maryland should recover from last season’s bizarre quarterback situation. With just one season left in the ACC, Edsall wants to leave the conference on a high-note. Edsall’s 2013 success will definitely set the tone for 2014 when the Terps begin play in a more competitive Big 10 conference.